Den dyre Julius Caesar mønt ikke solgt. 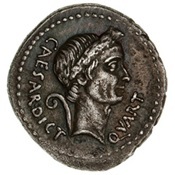 Julius Caesar, dictator from 49 BC till his assassation in 44 BC, Denarius, Rome, first half of January 44 BC, moneyer, Marcus Mettius, Crawford 480/2a, Sydenham 1057, Cohen 36, Babelon Julia 31, Alföldi 2, BMC 4135, 3.99 g, minute porosity under a wonderful dark and slightly iridescent toning. Perfectly centered, well-struck, of the best possible style and without a question one of the best in private hands - The excessive rarity of this highly important issue is demonstrated by the fact that it was not included in the otherwise formidable "RBW collection of Roman Republican Coins" which was recently sold by NAC - This exceptional piece of ancient minature art is not only the most important of Caesar's isssues but a "non plus ultra" of Roman coins in general. Nürnberg, 8 Ducats 1698 GNF (Georg Friedrich Nürnberger), Friedberg - (cf. 1869 - 1870). Whereas 5 and 6 Ducats with some frequency occur on the market, denominations larger than this are of the utmost rarity, and to the best of our knowledge the present piece might be the only round 8 Ducats in existence.